BETWEEN 150mm and 250mm of rain has been forecast to fall in Townsville over the next 24 hours, bringing the combined total rainfall for this event in excess of 500mm. The Bureau of Meteorology has forecasted isolated falls of up to 350mm within the severe weather warning area, which covers the Townsville region. Authorities are warning homes could be flooded. Fire and Emergency Services Minister Craig Crawford said he'd been briefed by weather authorities who warned of the high rainfall totals expected. "Reports to me, are different parts of Townsville have seen 80 to 200mm already today," he said. "If you get 200mm in the last 24 hours, and you're going to get 300mm in the next 24 hours. "That's a half a metre of water potentially dumped in some of these places. "The actual amount that rivers and creeks will come up is well above half a metre ... it's got the potential to really cause some havoc." A SEVERE weather warning has been activated for Townsville as heavy rain continues to buffet the city. The notorious 'dome' of Townsville has broken and large totals have been recorded in the Ross Dam catchment and beyond. The Bureau of Meteorology issued a warning for heavy rainfall in Herbert and lower Burdekin forecast districts at 5.31am today. "Showers and thunderstorms are likely to produce heavy rainfall that may lead to flash flooding in the warning area over the next several hours. Locations which may be affected include the west of Townsville and Rollingstone," the bureau warned. 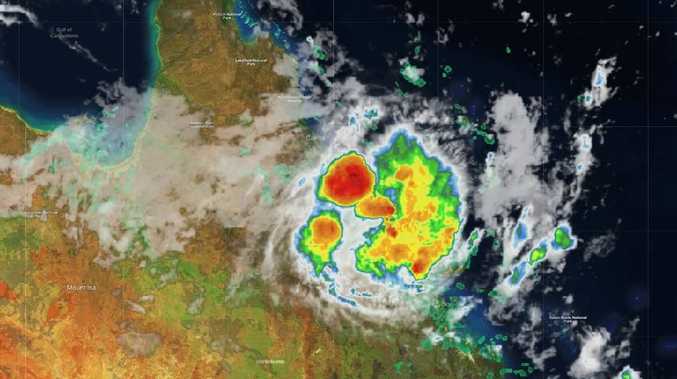 The warning was issued after a night of heavy rainfall on Townsville proper, with the radar showing a system hovering over the city in what has been dubbed the "dome in reverse". Bureau forecaster Sean Fitzgerald said Townsville was normally a sheltered location terrain-wise, meaning rainfall was blocked by geographical features. He said in this case the system had formed in situ allowing heavy rain to fall across the city. "There's been an upper low working the area (Townsville) for the last few days allowing for decent rainfall," he said. "A surface low just off the coast has helped drive further rainfall." Mr Fitzgerald said the highest totals were at Mount Stuart (138mm) and Woodlands (121mm). He said the heavy rainfall would likely continue into the morning meaning it would be a "rainy day ahead". He said although the weather may feel "monsoonal" to residents, a monsoon was not likely to form this week. Mr Fitzgerald said the Ross Dam had received 94mm in the last 24 hours and 281mm in the past week. In the past eight days the Dam has recorded 301mm of rainfall and Townsville City Council has announced it will cease pumping water from the Burdekin Dam today. The Ross Dam was this morning at 20 per cent capacity. It's been a week of heavy rain for the long-parched city. Homes in the north west suburbs of Townsville became unwelcomed river front properties with streets and some houses inundated with water. On Monday the Bureau of Meteorology forecasting up to 240mm could fall this week until Sunday.